The American Angler Guide to Fly Fishing For Trout will, within a brief 176 pages, provide the beginning and intermediate angler with everything they need to know in order to successfully fly fish for the most popular quarry in America. It will contain the essentials of casting, the basics of both dry fly fishing and wet fly fishing, a primer on various species of trout, and an overview of prime destinations for planning your trip. Presented in 4-color, there will be forty to fifty color photographs as well eight to ten line drawings illustrating casting and knot-tying fundamentals. The American Angler Guide will be matched with Fly Tyer’s Guide to Essential Trout Flies. Aaron Jasper is an elementary school teacher in Paterson, New Jersey. He has been fly fishing since age 6. He has traveled all over the United States and Europe. Lifelong learning is his passion. He is also a contributing writer for American Angler and Fly Tyer. Sharing his passion for fly fishing and teaching is life. 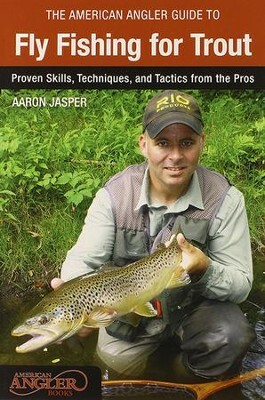 I'm the author/artist and I want to review The American Angler Guide to Fly Fishing for Trout: Proven Skills, Techniques, and Tactics from the Pros.